St Johnstone moved within two points of fourth place in the Scottish Premiership by despatching 10-man Inverness CT, who now sit bottom. Liam Craig swept home Steven MacLean's delivery in with 14 minutes gone. ICT captain Gary Warren was dismissed for two bookable offences in quick succession after the break, leading to Murray Davidson firing in a second. Danny Swanson broke neatly into the box and killed off Caley Thistle in the final 10 minutes with a low finish. The case for the Caley Thistle defence? Inverness, now propping up the league table, have conceded more goals than any other side in the Premiership. Their rearguard were all lured to the ball for the opening goal. Good play from MacLean drew in a posse of defenders before he played in Craig to deftly finish from the edge of the box. When skipper Warren was sent-off you feared the worst for Inverness. His first yellow was for persistent fouling. His second came soon after for a foul on Swanson as the forward skipped past him. The resultant free-kick led to Davidson doubling the Saints lead. Injuries have not helped Caley Thistle's cause at the back - Ross Draper was forced to play centre-back - but boss Richie Foran must be concerned about the porous nature of his defence. 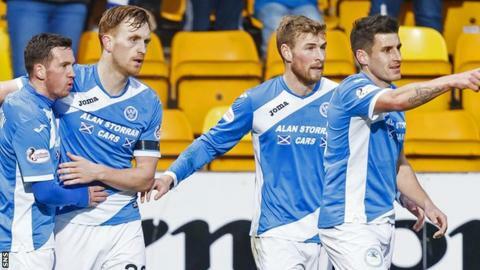 St Johnstone had lost three of their four home games ahead this match. Manager Tommy Wright knew it was vital his side stopped conceding poor goals. It was better in the first half. Often Inverness got to the St Johnstone box only to be rebuffed by a ring of light blue steel that resulted in the visitors barely getting a sniff of goal. Overall Inverness looked toothless but credit to St Johnstone for looking more like their resolute selves. There was a swagger about Wright's side after they opened the scoring, but they had to wait until the second half to increase their lead. They might have had a penalty when Richard Foster went down in the box under challenge. It looked a bit soft and referee Euan Anderson waved it away. St Johnstone deserved another goal, though, and it came after Warren's dismissal, Davidson finding the bottom corner from the ricocheted free-kick. Swanson added the icing to the cake with a third goal 10 minutes from time, as Saints sealed an utterly deserved victory. St Johnstone manager Tommy Wright: "We started on the front foot, got the goal, then after the first and second goals we dropped off a little bit. Inverness got back into it without causing us many problems. "Our achilles heel this season has been not defending crosses into the box and set plays, and I thought the two centre-halves and Murray Davidson in particular dealt with them well. "Swanson's goal is a good, quality goal, and we probably could've scored more when they went down to 10. I'm pleased with the three points and probably equally pleased with the clean sheet." Inverness CT manager Richie Foran: "We got what we deserved. We've gone from one of our best performances of the season (against Dundee) to probably our worst. It's very disappointing. Talk about being inconsistent - that's sums us up this season. "You're in there before games trying to motivate them and they're talking the talk, all the clichés, and they're going out there and not walking the walk. Go do your talking on the park - we didn't today. "I can't be too harsh on the lads, their attitude is wonderful day in, day out, but you get paid to perform in the match and we've not performed over the last three or four games. "But I know exactly what I need to bring in - our problem is we've got too many attack-minded players, we're right up there on the goal charts, but we're worse off on goals against, so we need more defensive-minded players and I'll go and get them (in January). The funds are there." Match ends, St. Johnstone 3, Inverness CT 0. Second Half ends, St. Johnstone 3, Inverness CT 0. Attempt missed. Liam Craig (St. Johnstone) right footed shot from a difficult angle and long range on the right is too high from a direct free kick. Substitution, Inverness CT. Cameron Gilchrist replaces Carl Tremarco. Attempt missed. Graham Cummins (St. Johnstone) right footed shot from the centre of the box is close, but misses to the left. Substitution, Inverness CT. Alisdair Sutherland replaces Lonsana Doumbouya. Attempt missed. Christopher Kane (St. Johnstone) right footed shot from the centre of the box misses to the left. Substitution, St. Johnstone. Christopher Kane replaces Danny Swanson. Foul by Lonsana Doumbouya (Inverness CT). Goal! St. Johnstone 3, Inverness CT 0. Danny Swanson (St. Johnstone) right footed shot from the centre of the box to the bottom left corner. Assisted by Brian Easton. Substitution, St. Johnstone. Blair Alston replaces Michael Coulson. Attempt blocked. Billy King (Inverness CT) right footed shot from the centre of the box is blocked. Attempt blocked. David Wotherspoon (St. Johnstone) right footed shot from outside the box is blocked. Attempt missed. Billy King (Inverness CT) right footed shot from outside the box is just a bit too high. Attempt saved. Larnell Cole (Inverness CT) right footed shot from outside the box is saved in the bottom right corner. Substitution, Inverness CT. Jake Mulraney replaces Aaron Doran. Corner, Inverness CT. Conceded by Murray Davidson. Attempt blocked. Iain Vigurs (Inverness CT) right footed shot from outside the box is blocked. Goal! St. Johnstone 2, Inverness CT 0. Murray Davidson (St. Johnstone) left footed shot from the centre of the box to the centre of the goal. Assisted by Michael Coulson. Second yellow card to Gary Warren (Inverness CT) for a bad foul. Gary Warren (Inverness CT) is shown the yellow card.